The Monroe County Fairgrounds is available for rent during the majority of the year. Our calendar is easily accessed below or on our homepage. The fairgrounds are a great location for various types of events and is rented on a first come, first-served basis. 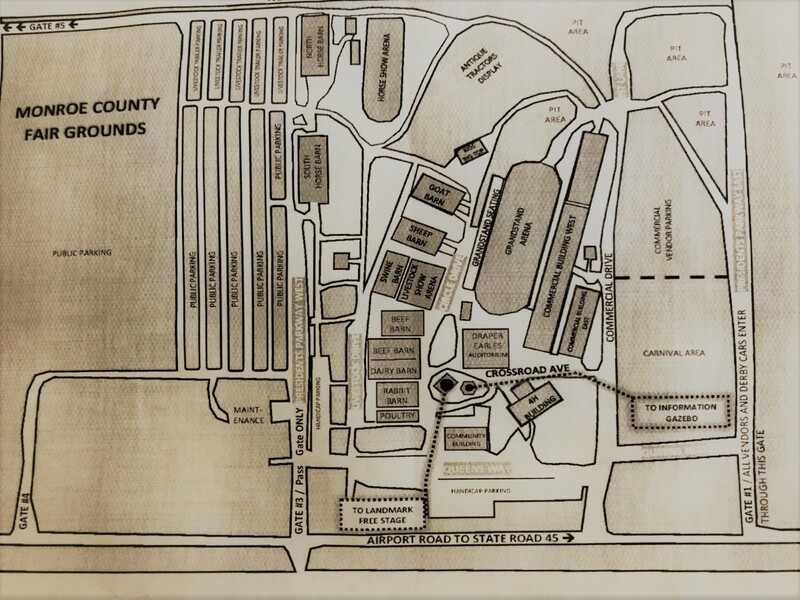 With easy access to Highways 45, 48, 37 and I-69, along with a wide variety of buildings, campgrounds, and vast grassy areas, the fairgrounds makes a fantastic location for banquets, parties, small gatherings, family reunions, trade shows, conventions, or musical or theatrical performances. Parking is never a concern for most events and additional parking for larger events is an additional option. This building is heated and air-conditioned, with plenty of lighting and room for most any event. There is a full stage with dressing rooms on both sides, each with private bathrooms. NO animals are allowed in the auditorium, with the exception of service animals. Seating: Bleachers are available to be out or in depending upon your event. 30 round 60" tables, 20 8'-long rectangular tables, and chairs are provided. Sound equipment is available at an additional cost if needed. Both buildings have asphalt floors, as well as sliding doors on both ends and another sliding door on one side. Restrooms are in an additional building just east of the Commercial Buildings. East: This building is 60 ft X 180 ft.
​West: This building is 60 ft X 360 ft.